Blah Blah Blah band members from left to right: Bryon Hardin, Solomon David, Phillip Ferguson and Dario Arcos. Photo from the Blah Blah Blah Facebook page. “A prophet is without honor in his hometown,” proclaims Solomon David. Despite his use of the aforementioned, paraphrased line from the Bible, David is neither a prophet nor a preacher. He’s the lead singer of the Chicago band Blah Blah Blah, and he’s eloquently explaining to us why he’s so eager to tour outside of Chicago. This fall he should get his chance to find honor on the road, as Blah Blah Blah — or as we call them, the Blah’s — is planning on performing in venues on the East and West Coast’s of the U.S. After toiling in the Chicago music scene for the last three years, it’ll be an important step toward going from just a good Chicago band, to a good band that just happens to be from Chicago. “There are so many people here, and Chicago is a great city, but there’s also a big world out there,” says David on his desire to introduce the Blah’s music to a national audience. If a national audience catches on, they’ll be introduced to a sound the group describes as “ballroom rock.” The Smiths is who they are often compared to, although Drummer Dario Arcos also mentions Broken Social Scene as a big influence (and yes, we could totally hear them covering “Lovers Spit” to a tee). The Blah’s guitar riffs are precise and subdued, the bass riffs are moody and measured, and the synthesizer beats are sonic but slightly distant. If you desperately need a familiar music genre to catalog them in, then dream pop comes to mind. 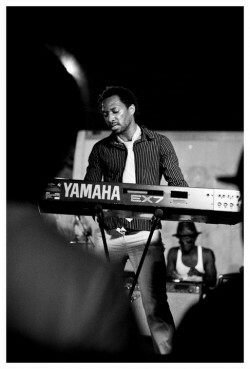 Blah Blah Blah member Phillip Ferguson plays the keyboards at a recent show. Photo from the Blah Blah Blah Facebook page. 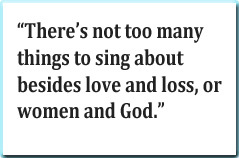 Like most song writers, he isn’t concerned about how people interpret his lyrics. He’s just concerned about people hearing them. 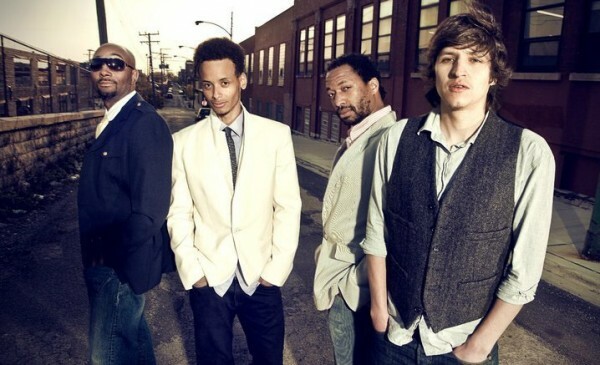 After spending several years performing in Chicago, he and the rest of the group understand how important it is to play their new music for fresh sets of ears in new locales. “When you get out [of your hometown] and start doing something you create a great energy, and when you come back to your hometown, people notice something is slightly different about you,” says David. With a new EP and a polished sound, it’s clear something is already different with the Blah’s. It won’t go unnoticed by their Chicago fans. And if things go to plan, it’ll be appreciated by many new fans in the coming months. The Blah Blah Blah’s new EP, titled Thank You Thank You, is available on their website, on iTunes, other online music stores, and in store at Reckless Records. 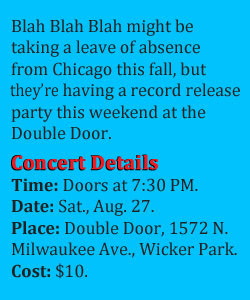 Tickets for their upcoming show at the Double Door can be purchased here. Also, check out the group’s video for “Why am I the Only One Laughing?” below.